A conservative journalist tried to fashion-shame the youngest woman ever elected to congress Alexandria Ocasio-Cortez, but was roasted by Twitter users instead. Ocasio-Cortez shot to fame earlier this year when she unexpectedly defeated ten-term representative Joe Crowley in the Democratic primary for New York's 14th district, and she looks set to help shape for course of US politics for years to come. Hill staffer sent me this pic of Ocassio-Cortez they took just now. I'll tell you something: that jacket and coat don't look like a girl who struggles. Eddie Scarry’s tweet came after the 29-year-old congresswoman revealed that she is only able to move to Washington DC once her congressional salary kicks in and she can afford rent. 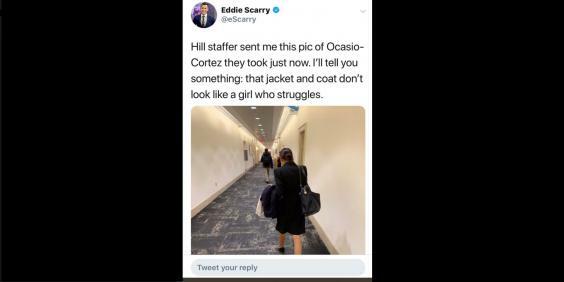 In a matter of minutes, Twitter users pounced on Scarry’s post to mock him for commenting on Ocasio-Cortez’s outfit.